The Pursuit of Public Journalism is an engaging introduction to the theoretical foundations and practices of the journalistic reform movement known as 'public journalism.' Public journalism - stated briefly - seeks to reinvest journalism with its fundamental responsibilities to democracy and public life. This book argues against many deeply ingrained practices ranging from journalistic detachment to framing stories via polar conflict in favor of greater civic involvement on the part of journalists. 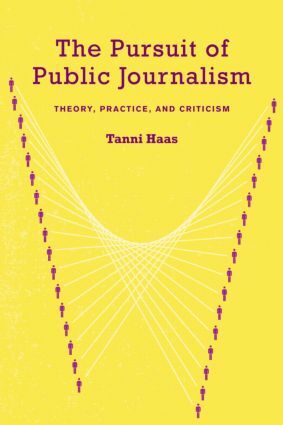 Tanni Haas traces the historical context in which public journalism emerged, develops a philosophy for public journalism, reviews empirical research on public journalism’s performance to date and responds to the major criticisms directed at public journalism. He also examines the particular challenges that public journalism poses to curriculum and instruction: how can journalism educators teach students to write stories useful and of concern to citizens, and how can they encourage citizens to publicly criticize news coverage of given topics? Following review of the major challenges and criticisms of public journalism, the author offers practical solutions for improving public journalism and speculates on public journalism’s likely future. From Public Journalism to the Public’s Journalism?